A new year, another new platform for Artur Beterbiev. Just one fight into his recently signed deal with Eddie Hearn and sports streaming service DAZN USA, the unbeaten light heavyweight titlist from Canada has decided to sever all ties and start fresh in 2019. That path will lead to a lucrative pact with Top Rank and ESPN. Le Journal de Montreal was the first to report this development. Beterbiev (13-0, 13KOs)—who has for years has held a tumultuous relationship with promoter Yvon Michel signed a three-fight co-promotional agreement with Hearn last summer, leading to his appearance on the stateside launch of DAZN USA’s boxing content. 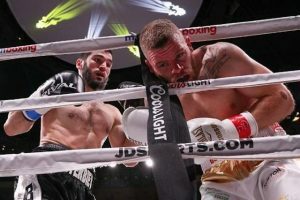 The 33-year old retained his perfect 100% knockout-to-win rate, but had to climb off the canvas before putting away previously unbeaten Callum Johnson in the 4th round of their title fight last October in Chicago, Ill.
His next fight was to come in December at New York City’s Madison Square Garden, where Beterbiev would’ve faced Long Island’s Joe Smith Jr. The light heavyweight title fight would’ve been the perfect complement to the debut of Saul ‘Canelo’ Alvarez both at MSG and on DAZN, but Beterbiev balked at the fight, instead electing to sit out the rest of 2018. The new year only produced the same tricks. A second attempt to reschedule Beterbiev-Smith led event handlers to tentatively set aside a late February date at Nassau Coliseum, less than an hour from Smith’s eastern Long Island hometown of Mastic, New York. Beterbiev once again reversed course, this time with the real reasons revealed—his intentions to fight elsewhere. Despite a three-fight deal in place, the light heavyweight titlist found a loophole that could potentially end the deal. According to a report from The Ring senior writer Mike Coppinger, Beterbiev’s promotional pact with Michel only remained in place through his alignment with adviser Al Haymon’s Premier Boxing Champions (PBC) platform. Haymon agreed to release Beterbiev in lieu of going to court over failure to meet his mandatory minimum of contractually guaranteed fights, which in turn nullified the boxer’s existing agreement with Michel. In turn, it would also effectively terminate any such arrangement with Hearn and DAZN, although that side is still being sorted out. While there remains a chance that Beterbiev and Michel—who has a strong relationship with Top Rank founder Bob Arum—will remain in business together, his next move in the ring won’t take place until past business is cleared up. What’s abundantly clear is that his next fight won’t come against Smith Jr., who is now being steered towards a March 9 title challenge of unbeaten Dmitry Bivol.